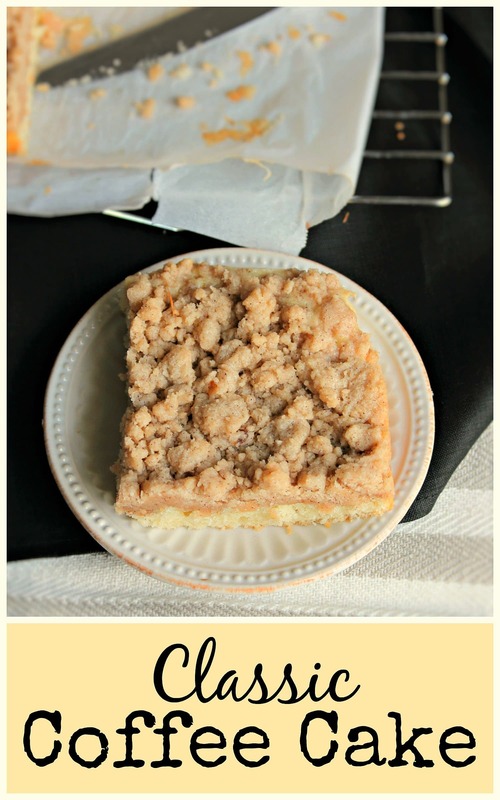 Classic Crumb Cake – This crumb cake is heavenly! The cake is super moist but slightly dense. The crumb topping is full of rich butter and cinnamon goodness. Together, these two elements make an unforgettable cake that you’ll want to have any time of the day! Food has been a major part of my life for as long as I can remember. In fact, all of my jobs in high school and college were at food places: supermarkets, restaurants, and coffee shops. My thought was always: if I like eating there, why shouldn’t I work there? Plus, the perks of the job were going to be free food so it seemed like the obvious choice, right?! Today’s post is inspired by a food that I ate very much at one of these jobs: classic crumb cake, hailing from the one and only Starbucks. Starbucks was my college job for about 3 years. It was super fast-paced since it was the location attached to the campus library. I loved it. Work went by really fast and we got to experiment with new drinks all the time. But, of course, the best part was eating all the yummy pastries. 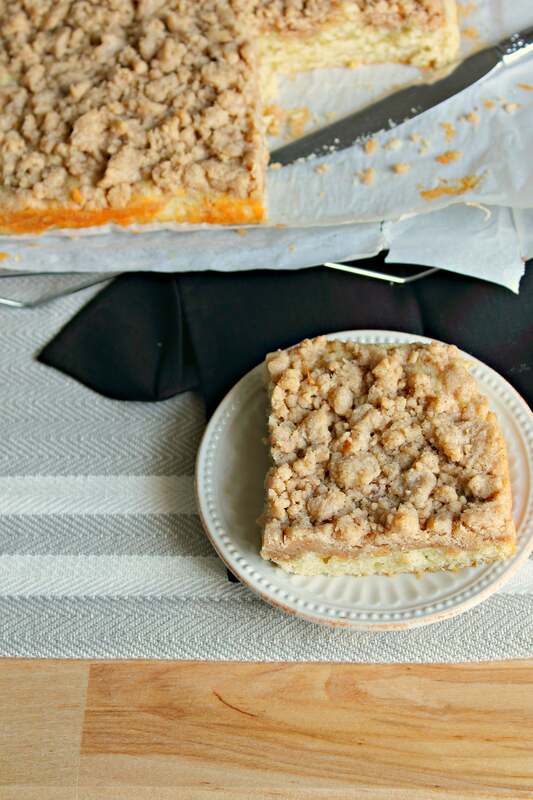 Crumb cake has been a staple at Starbucks for as long as I can remember. Have you had it before? There was just something about the soft cake topped with the dense, cinnamon crumbs that I was obsessed about. Plus, it paired beautifully with their coffee frappuccinos. Ahh to be 10 years younger and not care about calories…That was the life. I recently got a huge craving for this cake so I knew I had to make it next. I mean, Tyson has been choosing so many recipes recently so it was my turn! 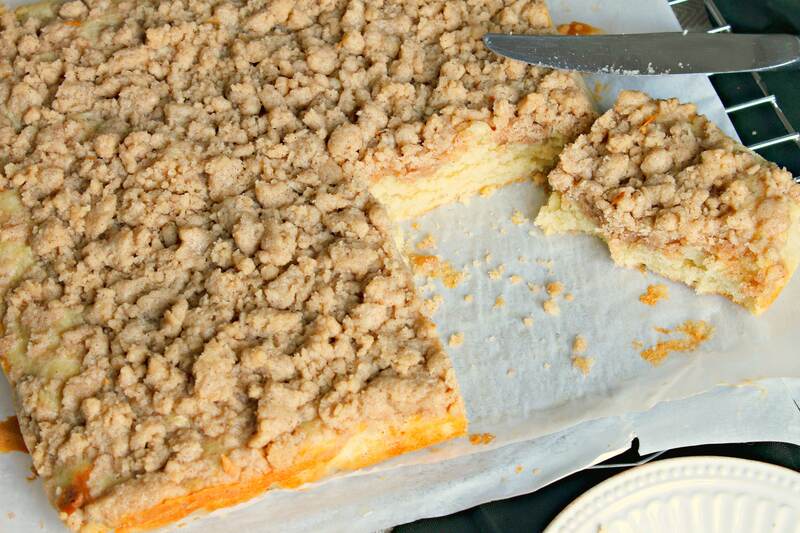 The combination of the cake and cinnamon crumbs just melts in your mouth. I can’t remember the last time I made a cake this moist. That’s where the sour cream comes in. Sour cream is a secret ingredient in many cakes to make them super moist, especially pound cakes. It sure does the job on this one, too! This is actually a really easy simple recipe. It felt nice to take a break from the recipes that took up my whole morning. The cake is ready in under an hour, so you can make it right as you wake up and still have it ready for breakfast. Or make them right after dinner and have them ready for dessert. This is also a great choice for Christmas morning, when you don’t feel like making anything complicated or time-consuming. And bonus, you probably have all these ingredients at home. Those are my favorite recipes! Rise and bake. No supermarket visits in my pajamas today, Publix. Do not forget to place the crumb mixture in the fridge while you make the cake batter. If the mixture does not cool down a little, the crumbs will be too warm and melt into the cake mixture when it’s baking. It will still taste amazing, but it won’t have the crumb texture you’re looking for. For an added presentation effect, you can sprinkle the top of the cake with powdered sugar just before serving. I totally forgot to do that because I couldn’t wait to dive in. But it adds a nice touch if you want to impress friends and family. Now, what are you waiting for?! Make this cake immediately! You won’t regret it. When you’ve tried them out, let me know how you like it in the comments below. Or let me know what kinds of jobs you had back in the day. Did anyone else work at Starbucks, too?! Last thing, and then we’ll get to the recipe. If you like this post, make sure to subscribe to the blog so you can get updates about the next posts, including the one later this week. It’s the fastest and most reliable way to stay updated. You can subscribe on the right hand side, under the heading “Stay Connected.” Hope to see you next time! 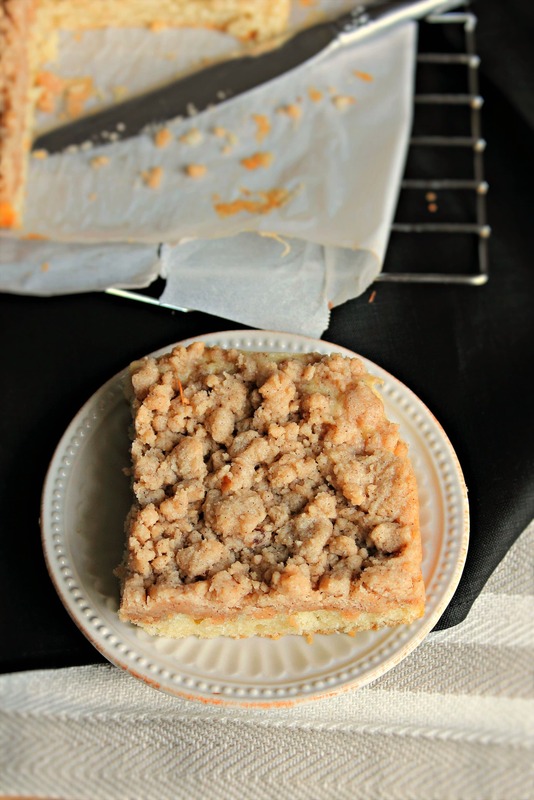 This crumb cake is heavenly! The cake is super moist but slightly dense. The crumb topping is full of rich butter and cinnamon goodness. Together, these two elements make an unforgettable cake that you'll want to have any time of the day! Whisk sugars, cinnamon, and salt together in a medium mixing bowl. Add melted butter and mix with a spatula or wooden spoon to combine. Add flour 1/3 of a cup at a time. Mix until fully combined. Place in refrigerator while you make cake batter. Don't worry -it shouldn't look like crumbs yet. Preheat oven to 350 degrees (325 if you have a dark-coated pan). Prep your 9x9 square pan by lining it with parchment paper with a little hanging over for easy cake removal. Grease the paper with butter to prevent sticking. Whisk flour, baking powder, baking soda, and salt in small bowl to combine. Set aside. Whip butter and sugar together with a stand mixer or a hand mixer until it becomes light and fluffy. If using a stand mixer, use the paddle attachment. Add egg and vanilla. Mix on low until fully incorporated. In a separate small bowl, mix sour cream and milk together. Add 1/3 of flour mixture to the butter mixture and mix until just combined. Add 1/2 of the milk mixture to the butter mixture and mix until just combined. Repeat again until flour and milk mixtures are fully incorporated into the butter mixture. Now you have the batter ready to go! Take a spatula, scrap down the sides of the bowl of the cake batter to make sure you have all the ingredients mixed in. Pour batter into prepared dish and spread into an even layer. Remove crumb mixture from the fridge. Using both hands, break apart the mixture into pea-sized chunks and cover evenly over the batter. They do not have to be even chunks. In fact, varied sizes gives the cake more character. Bake the cake in the preheated oven for 32-35 minutes, until a toothpick comes out clean. If you want a crispier top layer, cook for full 35 minutes. Once finished baking, place on rack to cool for 10 minutes while still in cake pan. Then remove from cake pan to finish cooling on the rack. Can be served warm or cooled. I made this and it is divine! Very easy, made it first thing in the am with a cup of coffee on hand so I could function. Crumble first, refrigerate it. Use only all purpose flour and follow the instructions. Next time I make it I am adding fresh blueberries from our bushes. Awesome cake and so worth the small bit of time it took as with anything from scratch. 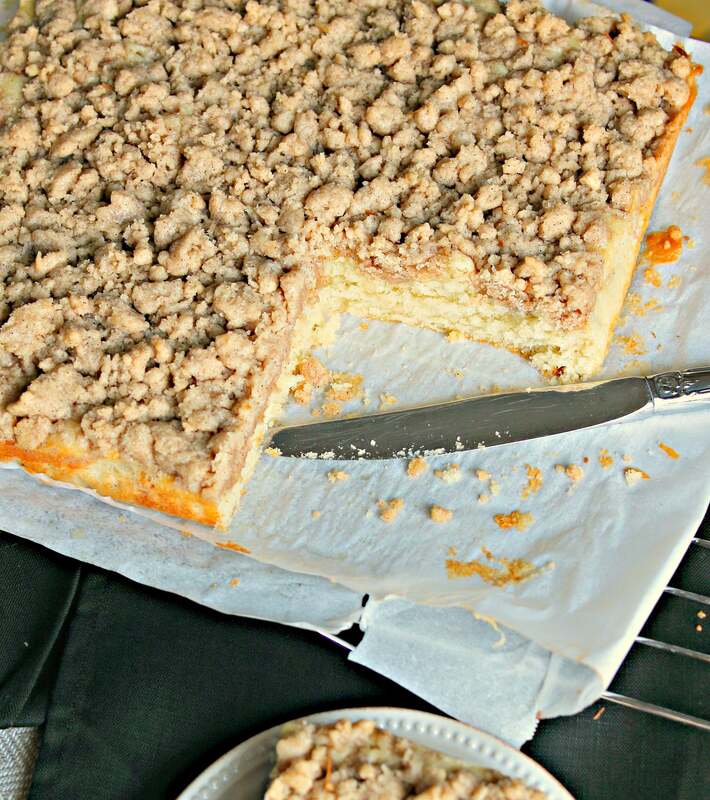 I made this for a Labor Day Weekend treat and it turned out GREAT… The crumb topping to cake ratio is perfect. Thank you Sharon! Woohoo! So glad it worked out for you, Ginny! It’s funny how we choose to do more work on labor day weekend. I’ve already baked three separate things this weekend and I’m not done yet! This sounds absolutely delicious! I’ve been doing more desserts lately – definitely adding this one to my list! Thanks so much! This is a perfect dessert if you don’t feel like working for hours but still want a showstopper. Enjoy! !